It’s never good to feel out of control of your life, and that’s especially true when it comes to your finances. Things can very quickly spiral when it comes to money. A change in circumstances, such as losing you job, or an unexpected expense can drastically alter the picture in your accounts. The only way to get back out of this predicament is to wrestle back control of your finances. You need to be able to chart a clear and achievable path back into the black, with a smattering of small and simple steps to take you towards this overall goal. Debt consolidation is a big part of that for many people. If you have a number of debts with different lenders – credit cards, loans, overdrafts – you will find it tough to chart that clear path. This confusing picture can become much clearer through the process of consolidation. Essentially this involves taking out one loan that pays off all of those different debts and then leaves you with one single payment to make. 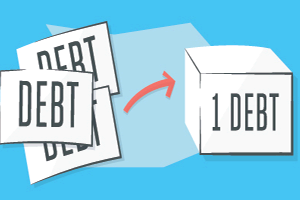 This piece on debt consolidation loans from Avant Credit offers an illustration of how this is then easier to digest – with one single payment date, one interest rate, one total debt target and one end goal in sight. Knowing all of these things can put you back in control and helps you to understand what you’ll need to do to pay off your debts. The process works if the borrower ends up paying less interest on the debt than they were previously. The overall monthly payment also should not increase if this is to effectively help the borrower to get control of their situation. People consolidating their debts should make sure their new arrangement is affordable – and affordable for the full length of the repayment schedule – and make sure they can afford to pay any fees for charges that might be involved in sorting their existing debts. Consolidation offers a real opportunity, but it’s important to get it right at the very start or it could simply move the problems from one lender to another. It’s also important to shop around. As with any other financial product, different debt consolidation loan providers will be able to offer different deals. Borrowers should pay close attention to the APR. The Money Advice Service offers a handy example of how debt consolidation can work. It uses the example of someone with £10,000 in credit card, pawnbroker and overdraft debts and demonstrates how this person could save more than £600 in interest and fees by replacing these debts with one consolidation loan. Saving money, understanding debts and planning a path towards a debt free future can all be achieved through a sensible consolidation process and, put together, these benefits help deliver the control you need.